Passant A "lion passant" is walking, with the right fore paw raised and all others on the ground. A "Lion of England" denotes a lion passant guardant Or, used as an augmentation. Statant A "lion statant" is standing, all four feet on the ground, usually with the forepaws together. This posture is more frequent in crests than in charges on shields. Salient A "lion salient" is leaping, with both hind legs together on the ground and both forelegs together in the air. This is a very rare position for a lion, but is also used of other heraldic beasts. Sejant A "lion sejant" is sitting on his haunches, with both forepaws on the ground. Sejant erect A "lion sejant erect" is seated on its haunches, but with its body erect and both forepaws raised in the "rampant" position (this is sometimes termed "sejant-rampant"). Couchant A "lion couchant" is lying down, but with the head raised. Dormant A "lion dormant" is lying down with its eyes closed and head lowered, resting upon the forepaws, as if asleep. Boutell, Charles (1978) . S. T. Aveling, ed. 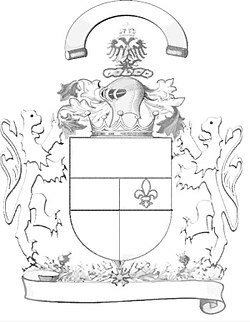 Boutell's Heraldry. London and New York: Frederick Warne & Co. It is used in an official capacity at royal residences in Scotland when the Sovereign is not present. Although now officially restricted to use by representatives of the Sovereign and at royal residences, used as a house flag, its proportions are 5,4, flag manufacturers themselves may adopt alternative ratios, including 1,2 or 2,3. The Lion rampant was legally used by King William I of Scotland as the grandson of King Malcolm III Canmore. The Lion Rampant has been used as a symbol by Royal descendants of Malcolm III beginning with King David I of Scotland The Great Seal was used by his 2nd great-grandson. Its use in Scotland originated during the reign of Malcolm III and they are linked to the legendary Milesian genealogies. An earlier recorded Scottish royal standard featured a dragon, which was used at the Battle of the Standard in 1138 by David I. The Royal Banner of Scotland is used officially at the Scottish royal residences of the Palace of Holyroodhouse and Balmoral Castle, the Royal Standard of the United Kingdom used in Scotland is flown when the Sovereign is present. 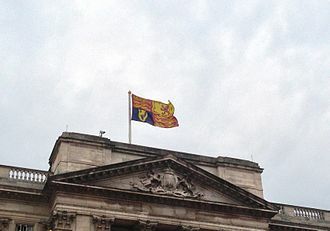 In the tradition of Scottish heraldry, use of the banner is not restricted to the sovereign, the personal banner of the current Duke, Prince Charles, features the same, displayed upon an inner shield. 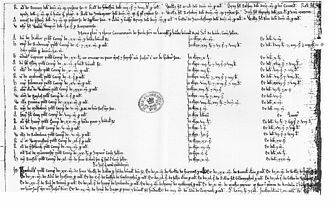 As the personal banner of the Sovereign, use of the Royal Banner of Scotland is restricted under the Act of the Parliament of Scotland 1672 cap,47 and 30 &31 Vict. cap. 17, and any unauthorised use of such is an offence under the Act, despite such action, the flag continues to feature on a variety of merchandise and souvenirs produced commercially for Scotlands economically important tourism industry. In 1934, George V issued a Royal Warrant authorising use of the Royal Banner of Scotland during the Silver Jubilee celebrations, due to take place the following year. However, such use was restricted to hand-held flags for decorative ebullition as a mark of loyalty to the Sovereign and it similarly appears in the Royal Standard of Canada, with the arms of Canada reflecting the royal symbols of England, Scotland and France. It appears in both merchant and military naval flags of the Italian Republic. The Lion of Saint Mark is the symbol of the award of the Venice Film Festival, the Golden Lion, other elements often included in depictions of the lion include a halo over his head, a book, and a sword in its paws. Venetian tradition states that when St. Mark was traveling through Europe, he arrived at a lagoon in Venice, where an angel appeared to him and said Pax tibi Marce, evangelista meus. St Mark, represented as a lion, is a typical Christian iconography derived from the prophetic visions contained in the verse of the Apocalypse of St John 4,7. The lion is one of the four living creatures described in the book as a place around the throne of the Almighty and these beings were previously described by the prophet Ezekiel. Behold, I send my messenger ahead of you, he will prepare your way, the voice of the one who cries in the wilderness, Prepare Ye the way of the Lord, make straight his paths. The lion symbolizes the power of the Evangelists word, the wings symbolize the spiritual elevation, the lion symbols express the significance of majesty and power, while the book expresses the concepts of wisdom and peace and the halo gives an image of religious piety. The Viking Age is the period from the late 8th century to the mid-11th century in European history, especially Northern European and Scandinavian history, following the Germanic Iron Age. It is the period of history when Scandinavian Norsemen explored Europe by its seas and rivers for trade, raids and conquest. Three Viking ships had beached in Weymouth Bay four years earlier, the Viking devastation of Northumbrias Holy Island was reported by the Northumbrian scholar Alcuin of York, who wrote, Never before in Britain has such a terror appeared. Vikings were portrayed as violent and bloodthirsty by their enemies. The chronicles of medieval England portrayed them as rapacious wolves among sheep, the first challenges to the many anti-Viking images in Britain emerged in the 17th century. Pioneering scholarly works on the Viking Age reached a readership in Britain. Archaeologists began to dig up Britains Viking past, linguistics traced the Viking-Age origins of rural idioms and proverbs. New dictionaries of the Old Norse language enabled more Victorians to read the Icelandic Sagas, the Vikings who invaded western and eastern Europe were chiefly pagans from Denmark and Sweden. 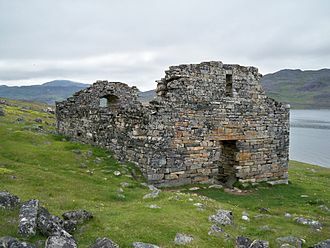 They settled in the Faroe Islands, Iceland, peripheral Scotland and their North Germanic language, Old Norse, became the mother-tongue of present-day Scandinavian languages. By 801, a central authority appears to have been established in Jutland. In Norway, mountainous terrain and fjords formed strong natural boundaries, communities there remained independent of each other, unlike the situation in Denmark which is lowland. By 800, some 30 small kingdoms existed in Norway, the sea was the easiest way of communication between the Norwegian kingdoms and the outside world. It was in the 8th century that Scandinavians began to build ships of war, the North Sea rovers were traders and explorers as well as plunderers. There are various theories concerning the causes of the Viking invasions, for people living along the coast, it would seem natural to seek new land by the sea. Another reason was that during this period England and Ireland, the Franks, had well-defended coasts and heavily fortified ports and harbours. 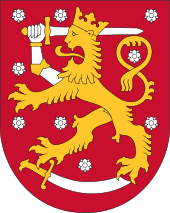 The coat of arms of Finland is a crowned lion on a red field, the right foreleg replaced with an armoured hand brandishing a sword, trampling on a sabre with the hindpaws. The coat of arms was created around the year 1580. The heraldic lion originated from the Lion of Judea is quite common in Western Europe, in Nordic heraldry, the lion is first found in the coat of arms of Denmark in the part of the 12th century. The first known use of the lion in Sweden was on the seals of Erik Knutsson and Erik Eriksson. The first king of the Folkunga family, Valdemar Birgersson, used 3 lions on his seal and this version of the arms was quite similar to the modern coat of arms of Finland, but the lion did not yet brandish any weapon. The grand-ducal coat of arms is thought to have resulted out of a combination of the Göta lion, the result was that the lion brandishes one weapon and treads on another. The best-known version of the coat of arms is found on the tomb of Gustavus I in the Uppsala cathedral. It has been suggested that either Duke John himself, or his brother Eric XIV, was leading the work on the heraldic signs on the tomb. Neither statement can be confirmed, but it is known that Eric XIV showed an interest in heraldry, the monument was commissioned from Guillaume Boyen, a Flemish architect and sculptor who had worked in Sweden. He started on the task in Antwerp in 1562, completing it 10 years later, the tomb was not in place in Uppsala until the early 1580s, and the finishing work lasted until 1591. In addition to the arms of Sweden and those of Finland. From Finland they include North and South Finland, as well as Tavastia and Karelia, the purpose of the nine roses remains unknown, but are now mostly considered to be decorative only. They have sometimes claimed to represent the nine historical provinces of Finland. 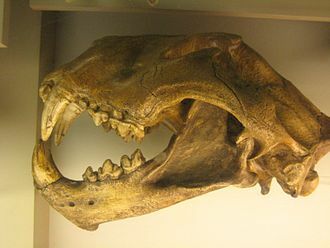 The lion experienced several changes during the 17th century, after Finland had been ceded to Russia, Elias Brenners version of the lion was chosen by the authorities as the model for the new coat of arms of the Grand Duchy of Finland in the Russian Empire. Obviously, any interpretation of the lion as trampling on a Russian sabre had been lost at point in time. The anti-confronted animals is the opposing motif, with the animals back to back. Bilateral symmetry is a dominant aspect of our world and strong representation of it with matching figures often creates a balance that is appealing in artwork, a related motif in ancient art is known as the Mistress of Animals. The column is thought to represent a goddess, abstracted to avoid tabooed direct representation, the motif called the Tree of Life, where two confronted animals graze on a shrub or tree, is very ancient. 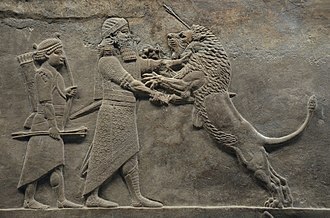 The reverse side of the Gebel el-Arak Knife handle, displayed at the top of the article, shows two powerful confronted lions, separated by a figure who is grasping them. Of note, the knob on the shows the top end of the hole for a cord or rope, on the suspension lug. Examples of confronted animals exist on Cylinder seals from Mesopotamia, deities, or heroes grasping lionesses, griffins, or other imaginary creatures are sometimes found. Many cylinder seals involving confronted goats surrounding a central Tree of life on a cone or mountain platform share one common theme, others may be thought of as deities holding the animals under their control. Because cylinder seals are numerous and come from pre-historical periods, back to the fourth or fifth millenniums, confronted snakes are frequent images in many cultures from ancient times to historical periods. A chlorite vessel from the area of contemporary Baghdad, Iraq is displayed at this link and it depicts three pairs of confronted animals. Two confronted snakes are being held in the hands of the figure, below the snake-pair are a pair of anti-confronted-lionesses. The third similar pair of animals on this item are two anti-confronted bovines with a human or deity between also, two tumbling lions and other animals are depicted to the right. 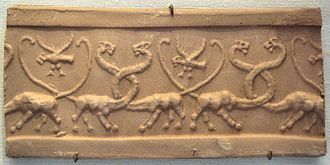 The Narmer Palette, used to mix cosmetics in the receptacle on one side, has two confronted felines, sometimes called serpopards forming the receptacle, close examination of the animals with the exaggerated, long necks supports identification as lionesses. The entire theme of the Narmer Palette, is about the pharaoh of the newly unified Ancient Egypt represented in two scenes, on one side the pharaoh wears the crown of Upper Egypt and on the other, the pharaoh wears the crown of Lower Egypt. 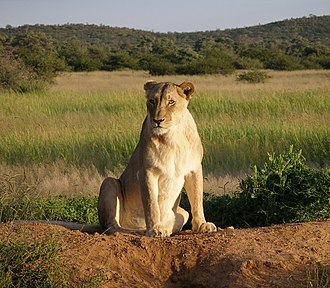 Lions, particularly male lions, have been an important symbol for thousands of years and appear as a theme in cultures across Europe and Africa. Despite the recorded incidents of attacks on humans, lions enjoy positive depiction in culture as creatures that appear strong. The most consistent depiction is in keeping with their image of king of the jungle or king of the beasts, hence lions are popular symbols of royalty and stateliness and a symbol of bravery. Some have proposed a conservative estimate in line with the better known cave paintings of Lascaux. In the Lascaux, two lions were depicted mating in the Chamber of Felines, found first in Ancient Egypt the sphinx, which had the head and shoulders of a human and the body of a lioness, represented the goddess who was the protector of the pharaohs. Later pharaohs were depicted as sphinxes, being thought as the offspring of the deity, bast originally was depicted as a lioness. The war goddess Sekhmet typically was depicted as woman with a head or. During the New Kingdom the Nubian gods Maahes and Dedun were depicted as lions, Maahes was absorbed into the Egyptian pantheon, and had a temple at the city Leontopolis City of Lions in Lower Egypt attached to that of the temple of his mother. Dedun was not absorbed into the Egyptian religion and remained a Nubian deity, the Egyptians held that a sacred lioness was responsible for the annual flooding of the Nile. 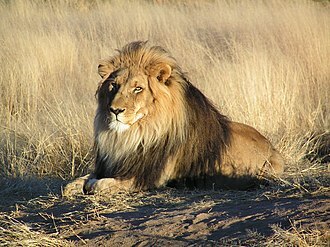 Lions were represented in other middle-eastern cultures, in ancient Mesopotamia it was regarded as a symbol of kingship. Ishtars Sumerian analogue Inanna was frequently depicted standing on the backs of two lionesses, such symbolism was appropriated by Saddam Husseins regime in Iraq for their Lion of Babylon tank, with the technology adapted from a Russian model. Lions have been used in sculpture and statuary to provide a sense of majesty and awe. Lions were bold creatures and many ancient cities would have an abundance of lion sculptures to show strength in numbers as well and this usage dates back to the origin of civilization. Henry I, known as Henry Beauclerc, was King of England from 1100 to his death. 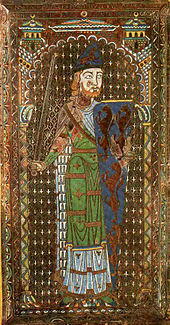 Henry was the son of William the Conqueror and was educated in Latin. 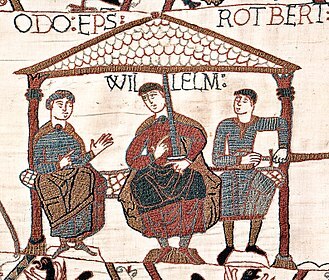 On Williams death in 1087, Henrys elder brothers Robert Curthose and William Rufus inherited Normandy and England, Henry purchased the County of Cotentin in western Normandy from Robert, but William and Robert deposed him in 1091. 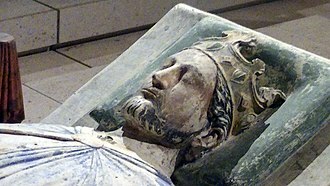 Henry gradually rebuilt his power base in the Cotentin and allied himself with William against Robert, Henry was present when William died in a hunting accident in 1100, and he seized the English throne, promising at his coronation to correct many of Williams less popular policies. Henry married Matilda of Scotland but continued to have a number of mistresses. Robert, who invaded in 1101, disputed Henrys control of England, the peace was short-lived, and Henry invaded the Duchy of Normandy in 1105 and 1106, finally defeating Robert at the Battle of Tinchebray. 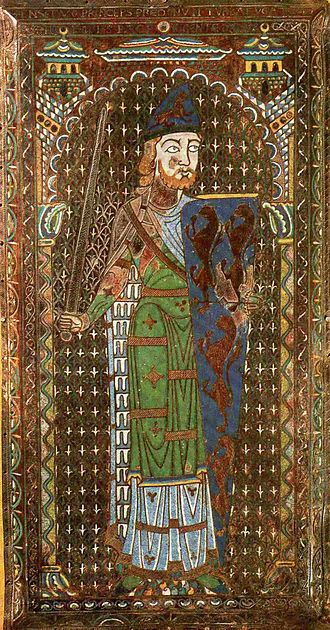 Henry kept Robert imprisoned for the rest of his life, following Henrys victory at the Battle of Brémule, a favourable peace settlement was agreed with Louis in 1120. 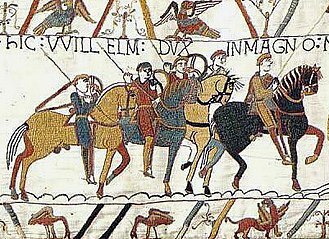 Considered by contemporaries to be a harsh but effective ruler, Henry skilfully manipulated the barons in England, Normandy was governed through a growing system of justices and an exchequer. Many of the officials who ran Henrys system were new men of obscure backgrounds rather than families of high status. Henry encouraged ecclesiastical reform, but became embroiled in a dispute in 1101 with Archbishop Anselm of Canterbury. He supported the Cluniac order and played a role in the selection of the senior clergy in England. 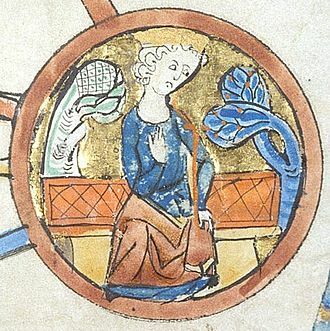 Henrys only legitimate son and heir, William Adelin, drowned in the White Ship disaster of 1120, Henry took a second wife, Adeliza, in the hope of having another son, but their marriage was childless. In response to this, Henry declared his daughter, his heir, the relationship between Henry and the couple became strained, and fighting broke out along the border with Anjou. Henry died on 1 December 1135 after a week of illness, despite his plans for Matilda, the King was succeeded by his nephew, Stephen of Blois, resulting in a period of civil war known as the Anarchy. Courage is the choice and willingness to confront agony, danger, uncertainty, or intimidation. In some traditions, fortitude holds approximately the same meaning, more recently, courage has been explored by the discipline of psychology. An early Greek philosopher, set the groundwork for how courage would be viewed to future philosophers, Platos early writings found in Laches show a discussion on courage, but they fail to come to a satisfactory conclusion on what courage is. During the debate between three leaders, including Socrates, many definitions of courage are mentioned, Laches is an early writing of Platos, which may be a reason he does not come to a clear conclusion. In this early writing, Plato is still developing his ideas, in one of his writings, The Republic, Plato gives more concrete ideas of what he believes courage to be. Civic courage is described as a sort of perseverance – preservation of the belief that has been inculcated by the law through education about what things, ideas of courage being perseverance are seen in Laches. Plato further explains this perseverance as being able to persevere through all emotions, like suffering, pleasure, as a desirable quality, courage is discussed broadly in Aristotles Nicomachean Ethics, where its vice of shortage is cowardice and its vice of excess is recklessness. In the Roman Empire, courage formed part of the virtue of virtus. Roman philosopher and statesman Cicero lists the cardinal virtues does not name them such, Virtue may be defined as a habit of mind in harmony with reason and it has four parts, justice, temperance. In medieval virtue ethics, championed by Averroes and Thomas Aquinas and still important to Roman Catholicism, according to Thomas Aquinas, Among the cardinal virtues, prudence ranks first, justice second, fortitude third, temperance fourth, and after these the other virtues. Part of his justification for this hierarchy is that Fortitude without justice is an occasion of injustice, since the stronger a man is the more ready is he to oppress the weaker. On fortitudes general and special nature, Aquinas says, The term fortitude can be taken in two ways, fortitude may be taken to denote firmness only in bearing and withstanding those things wherein it is most difficult to be firm, namely in certain grave dangers. Therefore Tully says, that fortitude is deliberate facing of dangers, on this sense fortitude is reckoned a special virtue, because it has a special matter. For it is difficult to allay fear than to moderate daring, since the danger which is the object of daring and fear. Now to attack belongs to fortitude in so far as the latter moderates daring, therefore the principal act of fortitude is endurance, that is to stand immovable in the midst of dangers rather than to attack them. In both Catholicism and Anglicanism, courage is one of the seven gifts of the Holy Spirit, for Thomas Aquinas, Fortitude is the virtue to remove any obstacle that keeps the will from following reason. In order to true courage in Christianity it takes someone who displays the virtues of faith, hope. Modern archaeologists recognise, among others, the Pazyryk and Aldy-Bel cultures, with the furthest east of all, the Ordos culture a little west of Beijing. The art of these peoples is known as steppes art. Over this period many Scythians became sedentary, and involved in trade with neighbouring peoples such as the Greeks. The mixture of the two cultures in terms of the background of the artists, the origin of the forms and styles, and the possible history of the objects, gives rise to complex questions. Many art historians feel that the Greek and Scythian styles were too far apart for works in a style to be as successful as those firmly in one style or the other. Other influences from urbanized civilizations such as those of Persia and China, Scythian art especially Scythian gold jewellery is highly valued by museums and many of the most valuable artefacts are in the Hermitage Museum in St Petersburg. Their Eastern neighbours, the Pazyryk culture in Siberia produced similar art, although related to the Chinese in a way comparable to that of the Scythians with the Greek. In recent years, archeologists have made valuable finds in various places within the area, the Scythians worked in a wide variety of materials such as gold, leather, bronze, iron and electrum. Clothes and horse-trappings were sewn with small plaques in metal and other materials, wool felt was used for highly decorated clothes and horse-trappings, and an important nomad mounted on his horse in his best outfit must have presented a very colourful and exotic sight. Other pieces are thought to be imports from Greece, as the Scythians prospered through trade with the Greeks, they settled down and started farming. They established permanent settlements such as a site in Belsk, Ukraine believed to the Scythian capital Gelonus with craft workshops and these include wood carvings, textiles including clothes and felt appliqué wall hangings, and even elaborate tattoos on the body of the so-called Siberian Ice Maiden. These make it clear that important ancient nomads and their horses and their iconography includes animals and anthropomorphic beasts, and probably some deities including a Great Goddess, as well as energetic geometric motifs. John, known as John Lackland, was King of England from 6 April 1199 until his death in 1216. 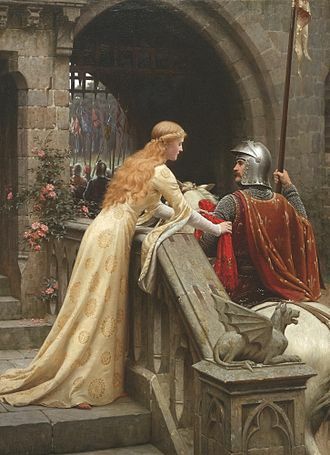 The baronial revolt at the end of Johns reign led to the sealing of Magna Carta, the youngest of five sons of King Henry II of England and Duchess Eleanor of Aquitaine, was at first not expected to inherit significant lands. Following the failed rebellion of his brothers between 1173 and 1174, John became Henrys favourite child. 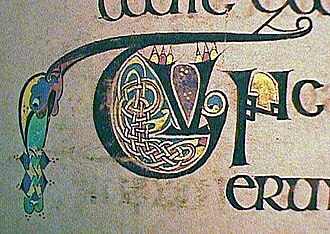 He was appointed the Lord of Ireland in 1177 and given lands in England, Johns elder brothers William and Geoffrey died young, by the time Richard I became king in 1189, John was a potential heir to the throne. 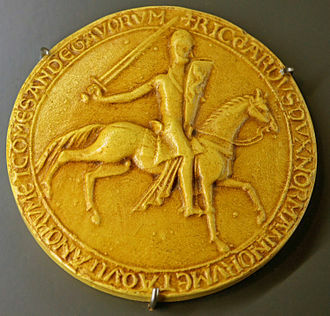 John unsuccessfully attempted a rebellion against Richards royal administrators whilst his brother was participating in the Third Crusade, John spent much of the next decade attempting to regain these lands, raising huge revenues, reforming his armed forces and rebuilding continental alliances. Johns judicial reforms had a impact on the English common law system. An argument with Pope Innocent III led to Johns excommunication in 1209, Johns attempt to defeat Philip in 1214 failed due to the French victory over Johns allies at the battle of Bouvines. 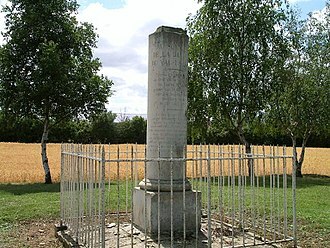 When he returned to England, John faced a rebellion by many of his barons, although both John and the barons agreed to the Magna Carta peace treaty in 1215, neither side complied with its conditions. Civil war broke out shortly afterwards, with the barons aided by Louis of France and it soon descended into a stalemate. John was born to Henry II of England and Eleanor of Aquitaine on 24 December 1166, Henry had inherited significant territories along the Atlantic seaboard—Anjou and England—and expanded his empire by conquering Brittany. The result was the Angevin Empire, named after Henrys paternal title as Count of Anjou and, more specifically, its seat in Angers. The Empire, was fragile, although all the lands owed allegiance to Henry. 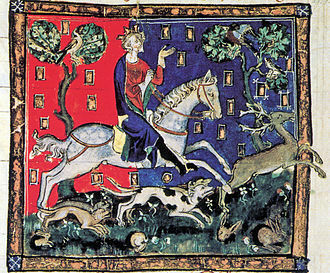 As one moved south through Anjou and Aquitaine, the extent of Henrys power in the provinces diminished considerably, scarcely resembling the concept of an empire at all. Some of the ties between parts of the empire such as Normandy and England were slowly dissolving over time. The region entered the Mesolithic around the 7th millennium BCE. The transition to the Neolithic is characterized by the Funnelbeaker culture in the 4th millennium BCE, the Chalcolithic is marked by the arrival of the Corded Ware culture, possibly the first influence in the region of Indo-European expansion. The Nordic Bronze Age proper begins roughly one millennium later, around 1500 BCE, Northern Europe enters the protohistorical period in the early centuries CE, with the adoption of writing and ethnographic accounts by Roman authors. The following is a listing of Northern European archaeological periods, expanded from the basic three-age system with finer subdivisions. During the 6th millennium BCE, the climate of Scandinavia was generally warmer, the bearers of the Nøstvet and Lihult cultures and the Kongemose culture were mesolithic hunter-gatherers. The Kongemose culture was replaced by the Ertebølle culture, adapting to the changes and gradually adopting the Neolithic Revolution. During the 4th millennium BCE, the Funnelbeaker culture expanded into Sweden up to Uppland, the Nøstvet and Lihult cultures were succeeded by the Pitted Ware culture Early Indo-European presence likely dates to the late 3rd millennium BCE, introducing the Nordic Bronze Age. The tripartite division of the Nordic Iron Age into Pre-Roman Iron Age, Roman Iron Age, the Pre-Roman Iron Age was the earliest part of the Iron Age in Scandinavia and North European Plain. Succeeding the Nordic Bronze Age, the Iron Age developed in contact with the Hallstatt culture in Central Europe, the Iron Age in northern Europe is markedly distinct from the Celtic La Tène culture south of it. Iron was extracted from bog iron in peat bogs and the first iron objects to be fabricated were needles and edged tools such as swords, Iron products were known in Scandinavia during the Bronze Age, but they were a scarce imported material. 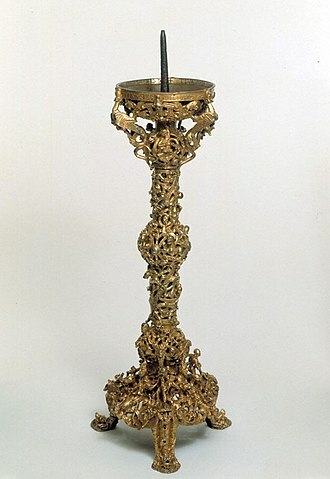 Similarly, imported bronze continued to be used during the Iron Age in Scandinavia, funerary practices continued the Bronze Age tradition of burning corpses and placing the remains in urns, a characteristic of the Urnfield culture. Archaeologists have found swords, shield bosses, scissors, pincers, needles, kettles, Bronze continued to be used for torcs and kettles, the style of which were continuous from the Bronze Age. Reverse of Alexander II's Great Seal, displaying the Lion rampant on saddle and shield. The German Hyghalmen Roll was made in the late 15th century and illustrates the German practice of repeating themes from the arms in the crest. (See Roll of arms). Enamel from the tomb of Geoffrey Plantagenet, Count of Anjou, one of the earliest depictions of modern heraldry. An extravagant example of marshalling: the 719 quarterings of the Grenville Armorial at Stowe. Coat of Arms of the Turiec county in Slovakia. 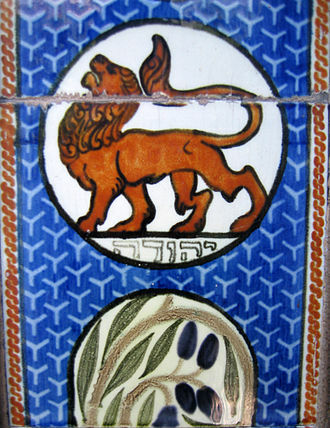 The Lion of Judah on a Bezalel ceramic tile. Bronze idol of a bear found in the Perm Krai, 6th or 7th century. Figure from Crete, holding confronted snakes, dated 1600 BC. Carving from Maria Laach Abbey, in the Eifel, Rhineland. 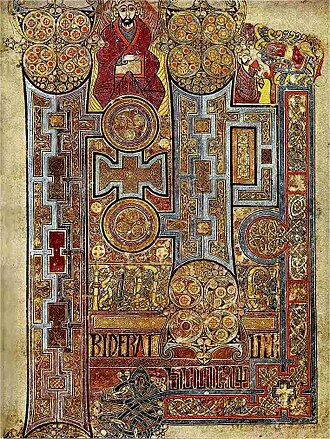 The "Morgan Leaf", detached from the Winchester Bible of 1160−75. Scenes from the life of David. Master of Pedret, The Virgin and Child in Majesty and the Adoration of the Magi, apse fresco from Tredòs, Val d'Aran, Catalonia, Spain, c. 1100, now at The Cloisters in New York City. 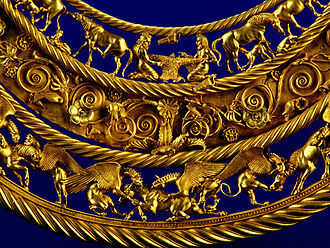 Gold Scythian pectoral, or neckpiece, from a royal kurgan in Tolstaya Mogila, Pokrov, Ukraine, dated to the second half of the 4th century BC. Tara Brooch, front view, early 8th century. 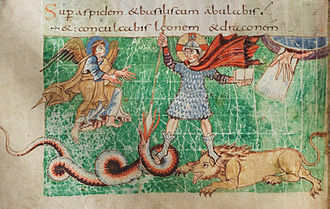 The lion symbol of St Mark from the Echternach Gospels.